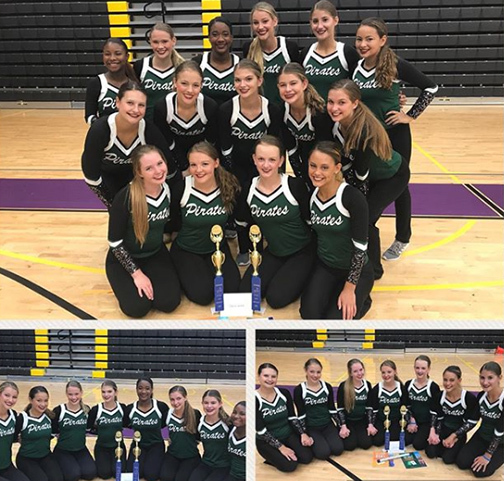 The Pattonville High School drill teams took home several honors after participating in the Universal Dance Association Elite Camp at the St. Louis College of Pharmacy. The varsity drill team placed first for its home routine and earned a superior trophy, a spirit stick and a “pin it forward” award. In addition, four seniors - Allison Brown, Emily Reyes, Hannah Schamber and Lacey Swanson - won All-American awards. The junior varsity team also earned honors at the camp. The team placed first for its home routine, won a superior trophy, earned a spirit stick and had two “pin it forward” winners. In addition, team members Anna Barrett and Niya Shockley were named All-American award winners. Grace Burgos, who won the Coaches Award at the camp, coaches the varsity team, and Kristin Riggs coaches the junior varsity team. Lindsey Purviance is an assistant coach.